Last month, after launching my book, I sat back and watched the number of books sold grow and the number of reviews increase. I should add slowly because it was great fun but a bit slower than I would want. I knew the reason why – I needed to promote further afield than my blog, my Facebook page, instagram and twitter. 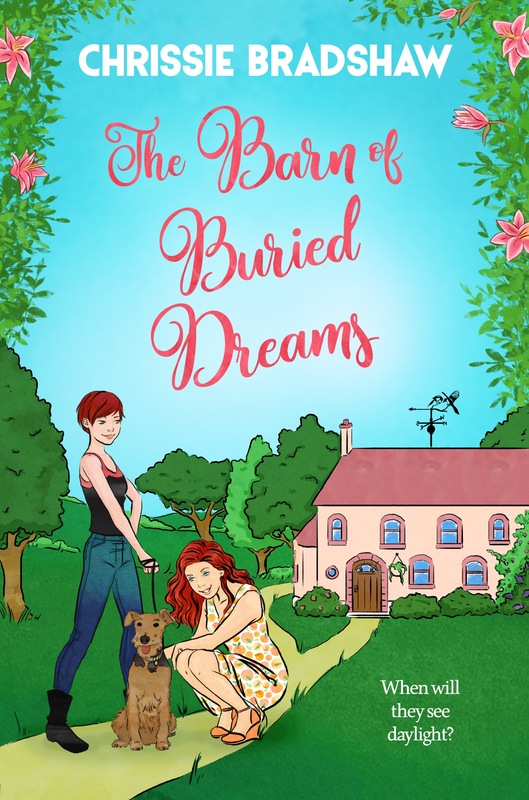 My books are not in shops and readers have to go onto Amazon to find them so the only way I can promote ‘The Barn of Buried Dreams’ is by raising awareness that it is out there by using my social media platforms. To attract readers who aren’t already friends, I must venture forth and use other people’s media space by asking them to allow me to blog or asking them to review my book. It is scary because a blogger can say ‘No, I don’t want you on my site and I don’t want to read your book, either!’ This, for me, is a time when you call in an expert to ask for willing volunteers, create a buzz about your book and to arrange your tour so it goes without a hitch. My book tour co-ordinator was worth her weight in gold. She sorted out 25 bloggers over 5 days who would give me an advertising platform. Some wanted read and review a printed book, some were happy with an ebook. Some wanted an exclusive interview, others were happy with an extract form the book or a blog from me. However, they all go their blog content via my tour guide and they could join a freebie competition too. The bloggers accepted me onto their space and I enjoyed giving interviews, writing a post or revealing an extract from my new book. I’d like to thank Rachel Gilbey and the bloggers on this poster for their hospitality and thank them for their thoughtful reviews about my writing. If you wander over ‘My Books’ The page shows some of their comments. My giveaway, which was drawn by rafflecopter, is ready for send off and the lucky winner is Andrea Upton. Her goodies are shown below. My hip operation went ahead In January but it hasn’t stopped me from getting out and about . With this trusty customised NHS stick and my new cross body book bag – a delightful Christmas present- I’ve been able to take a short walk for a pub lunch or a coffee. More calories going in than out with that arrangement that little voice in my head nags. I know! I had better be careful or I’ll pile a few more winter pounds on and stress my new hip. My RAS – reticular activating system- has come into play because I’ve been seeing and empathising with fellow stick users at every turn. I think the RAS part of our brain is astounding. My simple understanding is that it takes whatever we focus on and creates a filter for it. It then sifts through all the data it receives and presents only the pieces that are important to us at any time. When you’re pregnant, you notice other baby bumps and babies in buggies. When you want a new car, you notice how many of a certain model are on the road. When was the last time you noticed that your reticular activating system had come into play and started pointing something out to you? I’m sure it can help or hinder your New Year resolutions too because it filters the world to reflect your beliefs. If you think you are going to write rubbish, you probably will. If you believe you’re working well then you most likely will have a successful day. Your RAS helps you to see what you want to see and in doing so, influences your actions. It has been suggested that you can train your RAS by taking your subconscious thoughts and marrying them to your conscious thoughts and “setting your intent.” If you focus hard on your goals, your RAS will alert you to the people and opportunities that help you achieve them. This certainly takes the mystery out of ‘the law of attraction’ idea. Focus on important things and they will come to you because the RAS on your own brain seeks them out. The brain is amazing but so is the rest of the body’s ability to heal. Four hours after my hip op, I was walking with sticks and next day I was tested on walking up and down stairs before going home . My leg was working with a whole new ball and socket in it and it wasn’t too painful at all . The most fascinating healing is the skin’s ability to heal itself and my scar improves every day. So….here I am in week three enjoying a writer’s and reader’s meet up in a pub in town . I’m glad I joined North East Authors and Readers. I am excited about my current novel and, at the same time, worried that someone else will think of my wonderful idea. It’s both pleasure and angst being a writer and that’s why it’s so nice when a group of us meet up and understand all the fun but all of the insecurities too. I have to say I’m grateful to our wonderful NHS and its staff and I hope it’s something we never lose. I’m blessed to be pain free and I feel for all those who haven’t got a solution to their pain. What is the Story behind that 99p Read? 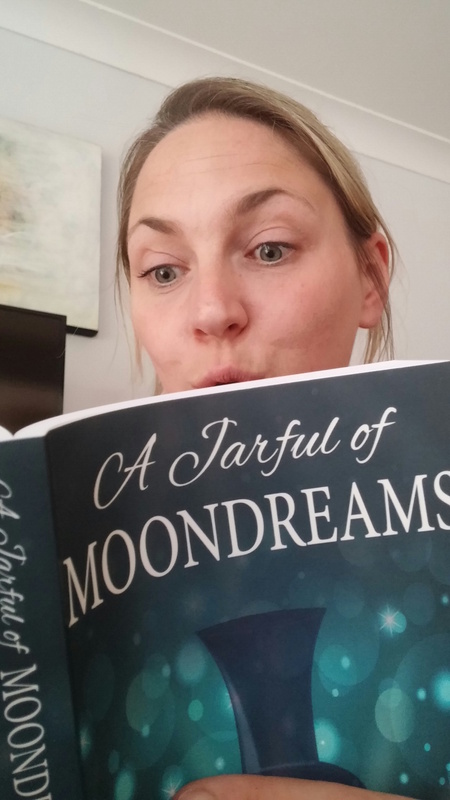 It’s hard to believe that A Jarful of Moondreams is one year old and on sale for 99p. What a year! It’s been full of highs and lows and lots of learning. Would I do it again? Yes. Would I do it differently? Of course! I made mistakes in publishing and promoting and learned from them. If I didn’t think I could do it all differently and more successfully the second time around I wouldn’t be writing this blog. Writing and publishing a novel is like carrying and giving birth to an infant. It’s full of anxiety as well as joy and producing the finished novel can be a long and painful process that other writers and imaginative readers can appreciate. Immediately after you write The End there is a niggling worry. Will another follow swiftly or will it be an only novel for years and years like Harper Lee’s ‘To Kill a Mockingbird?’ Like a parent, a writer just doesn’t know for sure. I think the most exciting time is when you finally present your months of hard labour to the reading world with a fanfare of tweets, blogs and giveaways. You want everyone to say kind things and most people do. The relief! Gradually, the initial buzz of interest lulls and leaves you feeling unsure and full of questions. Will your newbie grow legs and run? Will it be a crawler that sells oh so slowly? You help it along and continue to post proud parent pics and news as you start on book 2. Book 2 ( title to be revealed soon!) grabs your attention and you’re immersed in that until you look up and your published novel is a year old. If you’re lucky, the second is now ready to be delivered to the reading world and some readers are eagerly waiting for it. How can you cope with more than one leaving the nest? This is exactly where I am now and of course I’ll cope. I have so many role models who have a shelf crammed with books in their name and if they can let go time and time again then I’ll certainly try. Can I pause first though? Before I excitedly push book 2 put into the world, I just want to take a moment to enjoy my first book. I’d like to bask in the pleasure of knowing that readers enjoyed my novel and told others about it and it got great reviews. I need to let my debut know that it’s not forgotten. ‘A Jarful of Moondreams’ hasn’t been a great earner but it has brought me a wealth of knowledge and I’m proud of how it’s still selling for 99p this summer. I’m keeping my faith in its storytelling power and sending it on its way for another year. Frustration, Focus and Fun- That’s what my writing brings me. Let’s look at frustration – Does expectation feed frustration? I want to write brilliant novels that readers want to read and I want someone, an expert, to take the publishing part out of my hands. It’s a big ask, I know but I’m asking. The writing frustration comes and goes and, when the writing goes well, it’s a feeling like no other. After the hard work that went into publishing ‘A Jarful of Moondreams’ I can’t imagine how I’ll feel when someone tells me that they will do the publishing part. Frustration be gone! I’ve read that the best way to deal with frustration is to focus on the outcome I want instead of the obstacles in my way and that makes sense to me. I’m in this for the long haul and the success of publishing of my novels will seem even sweeter after scaling a series of obstacles. Those obstacles? They are just stepping stones to my goal. I try to focus on the right things – the possibilities rather than the problems. Whoever observed that if you chase two rabbits, you’ll lose both didn’t know the tenacity of an author. Only two? Writing involves taking time to promote book one and my writing , to complete re -writes on book two and to plan book three. Believe me, having my head in three different novels takes focus and I’m not letting any of them get away. Playing with words is fun and, as a writer, I do this every day. The other fun part of my writing life is talking about my writing journey to readers who might just buy my novel and using social media to network to readers and fellow authors. 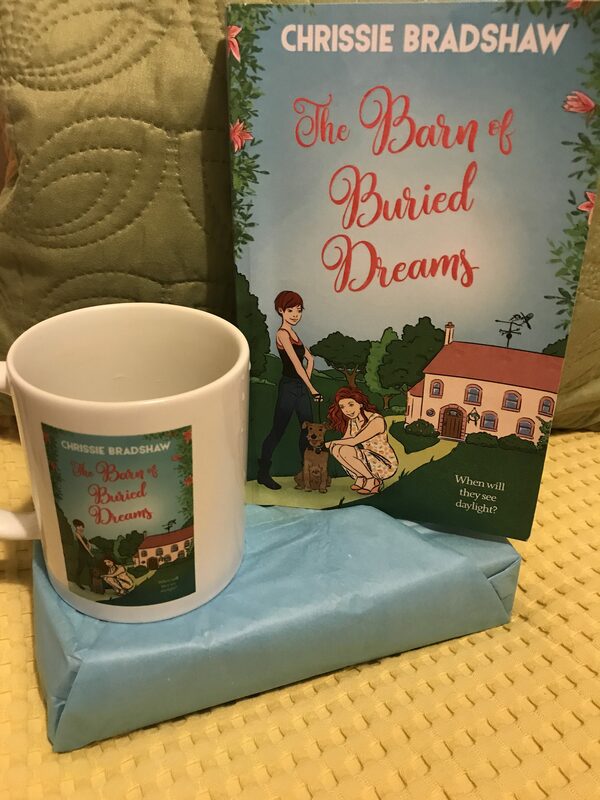 I’ve learnt that 4 and 5 star reviews from readers who have paid for your book and enjoyed it are the best reward for sharing your work with readers and that’s a good thing because new writers rarely make a living from their novels. The fabulous leg photo I used above was sent to me via Facebook by a reader who was reading this on holiday. It made my day. Making my novel better is fun. Novel two has had an excellent critique full of great advice from the wonderful RNA new writers’ scheme. I’m enjoying a final redraft and revision of the novel before pitching it to agents and publishers this summer. Winning awards is fun! OK only one award so far. The highlight of my writing year was to receive the Elizabeth Goudge Trophy at the Romantic Novelists’ Association gala dinner last July. I’ll be sad to return it from its pride of place on my sideboard but there is a future winner who will give it loving care next year. My first pitches for novel two will be at the Romantic Novelists’ Conference this July. Wish me luck!???? Why am I feeling over the moon? I have had a wonderful July. I was delighted to be an award winner with my short story ‘Such Small Moments’ at the Romantic Novelists’ Association dinner this month. The photograph below shows me being presented with the Elizabeth Goudge Trophy by the chairman, Eileen Ramsay. This totally unexpected honour made the gala dinner an extra-special one that I’ll always remember. I am over the moon because my debut novel, A JARFUL OF MOONDREAMS, is out in print and e-book on the 22nd and I have some pre-ordered copies. it is a great feeling to hold your completed novel and flick through the pages. Here is one of my beta readers who ploughed through my draft copy with her brand new paperback. She is checking the changes since her last reading and there were a few!